Blog Home Should I Paint or Plaster My Pool? Should I Paint or Plaster My Pool? Years ago, painted swimming pools were as much a part of everyday life as cassette tapes or station wagons. Pool owners didn’t have much choice, and probably didn’t even think about it – when the surface of the pool needed a makeover, they made a call, and a professional came out and did whatever was necessary, usually ending with a fresh coat of paint. 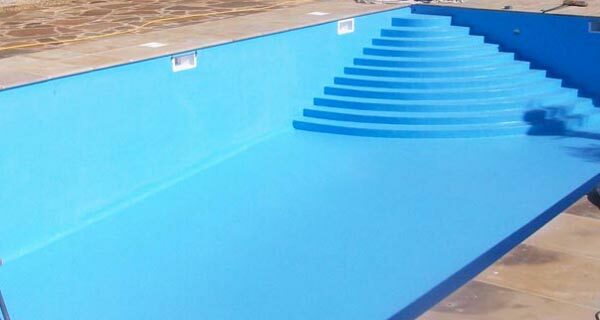 But that approach had its limitations, most notably paint chips ending up in the water, and when plastering became an option it was welcomed throughout the pool world as the new standard. Suddenly pool surfaces – especially in the Sun Belt where extreme summer weather takes its toll – were lasting longer, keeping their luster and generally making their owners much happier. In recent years, however, pool painting has made a resurgence, both in commercial and home applications. A full plastering job still typically runs several thousand dollars, and pool owners in areas with milder weather and/or shorter swim seasons are finding paint to be a solid and economical alternative. 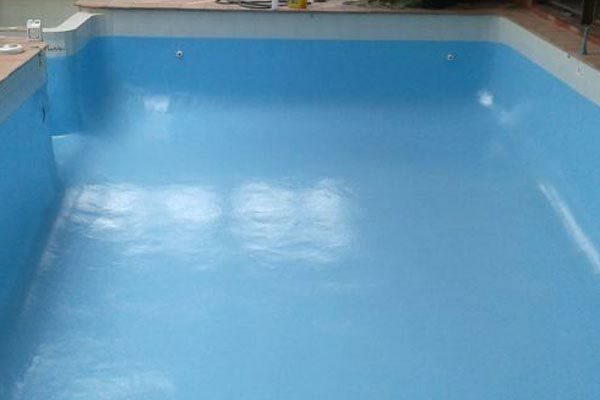 There’s often no obviously correct answer for someone weighing the two options, but there are several factors to consider before ever committing to a particular type of surfacing overhaul. Thinking it over - are you ready to take on painting your pool? It’s easy to compare a replastering quote to the cost of a few cans of paint and conclude that the choice here is simple. After all, there are numerous videos available showing how to paint a pool, and plenty of instructions online for handling the specifics. This information, on top of the obvious potential savings, seems to be playing a part in the recent paint movement. There’s a great deal of prep work involved in painting a pool, as opposed to leaning on experienced plastering professionals to handle all the dirty work. And in cases of pools in fairly extreme disrepair, at least some amount of structure replacement is necessary, making paint alone a clearly insufficient option. This level of renovation, like plastering in general, is better left to professionals. Its rugged makeup naturally helps plaster hold up better to temperature changes in the water as well as chemicals and volatile weather. In the hottest areas of the country, such as Texas and Florida, pool painting is all but nonexistent (especially for newer pools) because paint holds up poorly to intense heat and regularly needs recoating. Still, for some pool painting has its allure for several reasons. On top of the potential savings and an ever-growing knowledge base, paints have improved in quality over the years, and many would agree that a well-painted pool simply has a certain shine and glow that plaster alone doesn’t provide. Of course, painting a plastered pool is one way to achieve the best of both approaches, but that can be costly, time-consuming and fraught with the possibility of dual application problems as well. For the industrious pool owner, painting also offers an opportunity to place a stamp of individuality on a serious investment that should be providing beauty as much as leisure and recreation, plus a chance to deepen a sense of ownership and personal accomplishment. So if you feel that pool painting makes sense for you, here are some basics to consider. 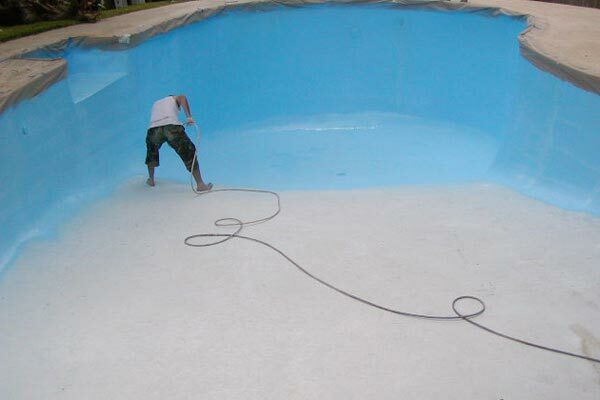 Again, the importance of preparing the pool beforehand cannot be overstated, since this is where many paint jobs go awry before ever really beginning. Professionals recommend first scrubbing the bare pool surface thoroughly with TSP (trisodium phosphate) to loosen up accumulated oils, grease and residue, then etching with a solution of equal parts muriatic acid and water before another round of TSP cleaning (shown below). As we've said, YouTube is an excellent resource for seeing this prep work put in motion, and Kelley Technical Coatings, maker of the Olympic pool paints we carry here at Pool Supply Unlimited, has excellent documentation about the entire process, such, as this general resurfacing overview and the process of watching and etching to prepare the pool surface. 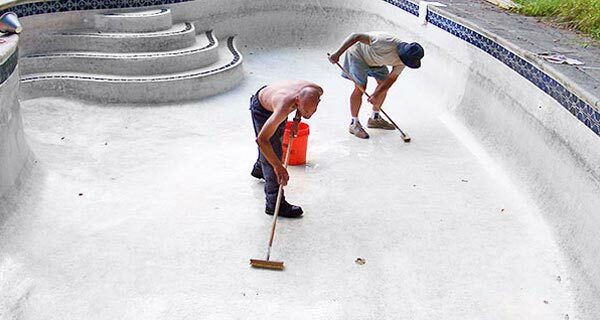 In those bygone days when painting dominated the pool finishing business, chlorinated rubber paints were the standard. Even today, many older, lesser-used pools have this type coating (or the somewhat newer and less expensive synthetic rubber paint), partly because it's easy to apply and requires no primer. But the lack of longevity of these paints (usually 2-3 years in the best case) and increasing environmental concerns have left rubber paints largely irrelevant in today's market, except for recoating older pools. Another option is water-based acrylic paint, which is popular partly because it can be applied to wet surfaces and because it can also be used to recoat older rubber paint jobs. Acrylics do well in the commercial side of pool renovation, since drying doesn't take nearly as long as with other paints, speeding up the job, and these pools are often resurfaced every season anyway so acrylics' similarly short longevity (2-3 years) isn't an issue. The emerging dominant force in the coating industry, particularly for residential use, is epoxy paint. It is generally the most expensive type, but its satiny finish, thicker texture and and longevity (generally 5-8 years) make it the preferred choice among owners of newer pools who are serious about saving in the long term as much as they are for the moment. As you can see, for concrete and plaster pools all three major types of paint are options, whereas epoxy paint is recommended in the case of gunite and fiberglass pools. As we said, each type has its advantages. Rubber paints need no primer and apply smoothly, acrylics dry quickly and also don't require primer while epoxy paints will take longer to apply but generally last far longer, providing potentially the best combination of value and durability. Our Paint - Pool and Deck category provides much more information about the entire painting process, including further details about each type of paint, the respective Olympic brand names we sell (such as Zeron and Paralon 2 shown in the chart above), the many colors available and the basics of applying them to the various pool surfaces. But hopefully this brief tutorial has at least made it clear that pool painting is a viable option for certain situations, as proven by its recent revival of popularity. To some, pool painting is at best an outdated notion that seems to offer far more work (and risk) than payoff. There will always be a segment of the pool world that prefers serious surfacing work to be done by professionals, and in many Sun Belt areas paint alone simply isn’t feasible as a long-term answer. But for those in more forgiving climates who are willing to take the time to learn and experiment and donate some elbow grease along the way, painting their pools is a viable option. The finished product can be well worth the extra effort, and when done correctly and patiently - can create an inviting attraction in your backyard and put far less stress on your pocketbook than entrusting someone else with your surfacing needs. You could very well find that painting is an entirely sensible option for you. Either way, by looking into it you'll know a lot more than you did when you started, and it's a fair bet you'll be more comfortable with your pool knowledge in general in the process. Best of all, help is always available. Our experienced staff is ready lend a hand in deciding if painting is right for you and your pool - honestly, we've seen plenty of cases where paint would do wonders and others where it would do little but make a bad situation worse. Call us whenever you like (or even better, email us with pictures of your pool) and we'll be happy to offer some free advice. Summer is approaching!